For 33 years, Celedon has been a part of our team. You read that right, 33 years. As a Site Crew Foreman, his job is one of the most physically demanding in our company. Throughout each challenge on the job, he always has a smile on his face and immense pride in his final product. It’s no surprise that over time he has become one of the most trusted individuals on our job sites. If there’s a new individual on-site that needs training, Cele is the mentor. On-site, Cele is a tough but fair leader who has worked on projects like Winrock Town Center, V. Sue Cleveland High School, NMSU’s Dominici Hall and Institute for Public Policy. There are few projects we have built in the last 33 years that Cele has not worked on. Greg Krause, Vice President of Field Operations notes that “Cele can see on the plans what will work and what won’t work before he places any concrete.” Safety has always been a core focus for our teams and Cele, keeps us “safe” by ensuring we do the work right once and inspires youth in our company to do the same. We are incredibly proud to be a part of a company with people like Cele who handle the loose ends, provide solutions, and develop a battle plan for any challenge. 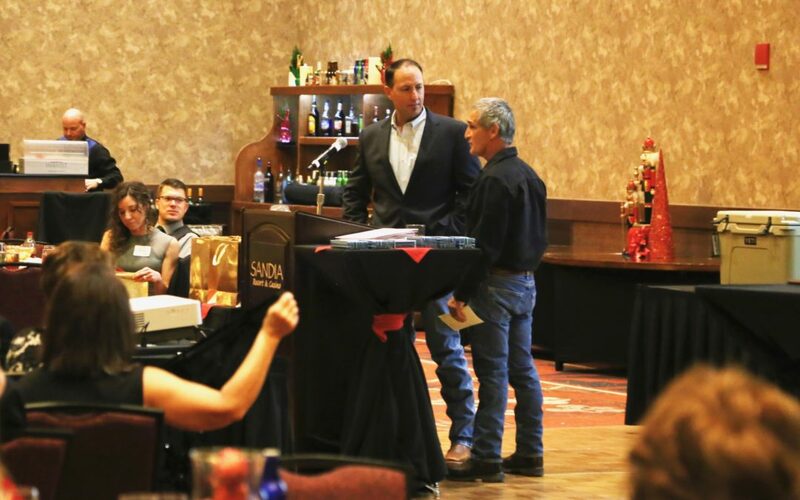 His integrity, dedication, attitude, and commitment to the craft of construction has lead to his award as Jaynes Employee of the Year, the highest award any Jaynes employee can receive internally.